3,425 Weimaraner Dogs adopted on Rescue Me! This map shows how many Weimaraner Dogs are posted in each state. 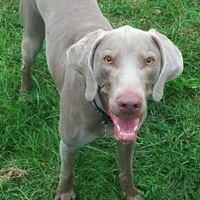 Weimaraner Rescue Information: The Weimaraner is a graceful gray gun dog. Weimaraners are rowdy, happy dogs. Weimaraners need discipline and strong leadership from the very beginning. This is not a breed for an inexperienced owner. Weimaraners are very territorial. A Weimaraner needs to be with people. Weimaraners are excellent with children but should be supervised around little ones because of the energy and size of the dogs. A Weimaraner can live in an apartment if it has plenty of daily exercise. Weimaraner Trivia: Weimaraners are named after the Grand Duke of Weimar, who enjoyed hunting with this breed of dog. The intelligence of the Weimaraner has earned it the nickname, Dog With a Human Brain. Dogs similar to the Weimaraner existed in France in the 1200s in the court of Louis IX. President Eisenhower owned a Weimaraner. Grace Kelly owned a Weimaraner.